Don’t just see the sights, take a taste of the town as well on this Philadelphia beer tour! Don’t just see the sights, take a taste of the town as well on this Philadelphia beer tour! Philly isn’t just home to sites that shaped our nation, it’s home to some of the best pubs and breweries in the nation as well! The Philadelphia beer scene is diverse, boasting famous local crafters that include Flying Fish, Dock Street Brewing Co., and Dogfish Head, and this will be your chance to sample them all as you explore the bars and pubs that populate the neighborhood surrounding iconic City Hall. 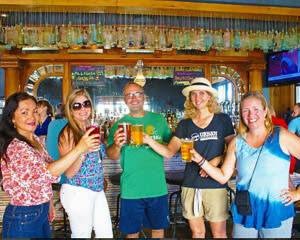 Once you meet your knowledgeable, local guide, you’ll make your way to the first of several native establishments to sample the ambiance and the brew. Each venue is selected for its contribution to the Philly beer scene, providing you with an eclectic mix of both unique and traditional environments. At each, your guide will treat you to not only a local brew and snack but also a history of the bar and how it made its name on the scene. Explore the vibrant neighborhood surrounding City Hall during happy hour! Drop into such exciting spots as the oldest continuously operating bar in Philadelphia (dating back to 1860), a classic dive bar, an Irish pub with local flair, a modern beer café, and many others. Sample craft beers from local breweries. Do your Philadelphia happy hour up right! Join in for the festivities and fun on this Philadelphia beer tour today!